Far from representing truly alternative voices, three Syriza leaders crafted empty public images as anti-austerity renegades and champions of democracy and justice. 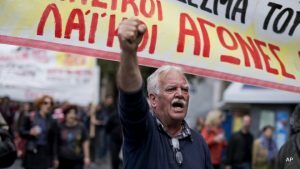 ATHENS — (Analysis) In January of 2015, opponents of neoliberalism and the harsh policies of economic austerity rejoiced at the electoral victory of Syriza in the Greek parliamentary elections. Flash forward to today: One year after ignoring the result of a referendum which rejected further austerity measures proposed by Greek lenders, the Syriza-led government is enforcing the dictates the third memorandum, an even more onerous austerity agreement agreed to in August 2015. In the interim, further legislation has been passed which has ceded control over the entirety of Greece’s publicly-owned assets for 99 years and relinquished the sovereign parliamentary right to pass legislation on key budgetary and economic issues. The end results of these agreements and the new austerity plan which has followed have been catastrophic. Already-battered pensions have been further slashed by as much as 50 percent or more. The port of Piraeus, 14 profitable regional airports, the national railway system, and the prime site of Athens’ former international airport have been sold off to foreign investors at bargain-basement prices and privatized. The sell-off of Greece’s municipal water utilities, which Syriza officials at one time claimed would occur “over our dead body,” is the next in line to be completed. Further, automatic budget cuts lurk ominously ahead, to be implemented automatically if Greece does not meet its troika-imposed fiscal targets. After a long period of dormancy, lulled by the promise of a government that was purportedly engaged in hard negotiations with Greece’s lenders, the people of Greece have roared back to life. Air traffic controllers recently staged a wildcat strike, walking off from their jobs in protest of the privatization of Greece’s airports–a process slated to be expanded to the remaining facilities in which the Greek state still owns a share. With nothing left to lose, pensioners have taken to the streets to protest the virtual elimination of their already meager pensions. 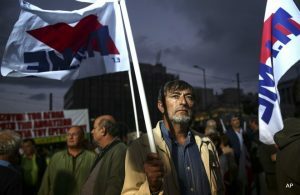 A protester chants anti austerity slogans during a demonstration in central Athens, on Friday, May 6, 2016. Within Greece at least, the hero worship previously afforded Syriza has transformed into a wide-ranging sentiment in which many citizens and voters now openly support “anyone but Syriza.” In such a climate, voters have once again begun searching in earnest for a new “savior” to rescue Greece from its death spiral of austerity, hopelessness, and crippling economic depression. Several such political personalities loom large in the imaginations of many voters, including “radical” economist and former finance minister Yanis Varoufakis, former speaker of the Hellenic Parliament and founder of the “Course of Freedom” party Zoe Konstantopoulou, and former energy minister and founder of the Popular Unity party Panagiotis Lafazanis. Do these personalities represent a true hope for change and optimism? Or are they merely the next in line to follow Syriza’s footsteps in promising radical change but delivering continued austerity instead? Their respective backgrounds and actions while in positions of power reveal the likely answer. Yanis Varoufakis has crafted a reputation for being a “radical,” “anti-austerity” renegade economist who is unafraid to break conventions and tackle the status quo. However, his record–particularly during his time as Greece’s finance minister from January to July 2015–tells a different story. In his early days as Syriza’s finance minister, Varoufakis entered negotiations at the February 2015 Eurogroup summit proposing the continuation of 70 percent of previously implemented austerity measures for an additional six months. 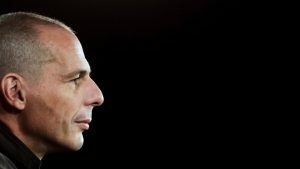 He refused to raise the possibility of a eurozone departure for Greece, not even as a “plan B” or a negotiation tactic. The 70 percent proposed by Varoufakis ultimately became an agreement for the continuation of 100 percent of the existing austerity measures for four additional months. Varoufakis, in his usual style, described the agreement as an exemplar of “creative ambiguity,” while suggesting that the troika now be referred to as the “institutions” instead. In these early days of the “first-time left” government, Varoufakis hired Wall Street firm Lazard to advise the Greek finance ministry. This is the same firm which advised the government of George Papandreou (whom Varoufakis advised for six years) on the signing of the first memorandum agreement in 2010, the government of unelected technocrat Lucas Papademos on the introduction of further austerity in 2012, and the previous New Democracy-PASOK coalition government on the privatization of public assets. Varoufakis’ “radical” rhetoric continued when he repeatedly stated, as finance minister, that Greece’s debt was legal and would be repaid “ad infinitum,” even while a parliamentary committee which was purportedly investigating the legality of this very same debt was in session. In an interview with The Associated Press, Varoufakis stated that he would “squeeze blood out of stone” in order to repay the IMF, while in another interview, Varoufakis stated that he sought to develop good relations with Christine Lagarde and the IMF, which holds views that he said he personally agreed with. In an interview with Australia’s ABC, Varoufakis further stated that even if the government wanted to proceed with the “Grexit,” it was unable to mint its own currency, claiming that Greece’s mint was destroyed when the country joined the eurozone. In reality, Greece’s mint is still operational; it’s where €10 notes are printed today. Former Greek Finance Minister Yanis Varoufakis, explains why he thinks Brexit could trigger dire economic consequences for the European Union. As finance minister, Varoufakis tapped Elena Panaritis as Greece’s representative to the IMF. This is the same Panaritis who was a former World Bank official and who was the architect of the catastrophic “Fuji Shock” policies implemented in Peru under the regime of the now-jailed Alberto Fujimori. These policies drove millions of Peruvians into poverty, resulted in price increases of up to 8,000 percent on basic goods, and led to the privatization of hundreds of public assets. Later, as a member of parliament with PASOK, Panaritis voted in favor of austerity and the memorandum agreements. In turn, Varoufakis, as finance minister, stated that previously implemented privatizations would not be rescinded and that he supported the privatization of public airports and harbors “under certain conditions.” He also spoke out favorably of the so-called “investments” of China’s COSCO, including the privatization of the port of Piraeus, describing this as a “positive development” for Greece. Forging ahead in the spring of 2015, Varoufakis, in his capacity as finance minister, oversaw the implementation of a governmental decree which confiscated the cash reserves of the entirety of the Greek public sector. Later ratified by parliament, including Varoufakis’ vote, the decree authorized the payment of the May 2015 installment of Greece’s loans to the IMF with the confiscated funds. This action was then followed up by a 47-page proposal crafted by the finance ministry under Varoufakis’ watch as part of supposedly “fierce” negotiations with the troika. That proposal foresaw €8 billion in new austerity measures, including a perpetually increasing primary budget surplus (which would mean more cuts in order to maintain a surplus in a sinking economy) and the privatization of major public assets. At around this time, Varoufakis presented a proposal for the introduction of a parallel currency, similar to the IOUs that had been issued by the state of California in 2009. He also announced the impending implementation of capital controls in the form of weekly limits on withdrawals from domestic bank accounts. These capital controls remain in place today and have significantly crippled the Greek economy, particularly small and medium-sized businesses which have been stripped of access to their own capital. This set the stage for the July 5, 2015 referendum which was scheduled soon thereafter. Varoufakis did not present any proposals to the people of Greece nor give any indication of what the government’s plan would be should the “no” vote against austerity prevail, as it ultimately did. Following his resignation from his post as finance minister–a well-timed move which allowed him to make a heroic exit in time to avoid the forthcoming trainwreck, Varoufakis was absent from the parliamentary vote which ultimately authorized Prime Minister Tsipras to make a deal with the country’s lenders. Varoufakis did publicly state, however, that had he voted in parliament, he would have voted to give Tsipras authorization to reach an agreement—authorization which led to the third, and harshest, memorandum agreement for Greece. Other highlights of Varoufakis’ tenure include his vote for corrupt conservative former New Democracy minister Prokopis Pavlopoulos as president of the Hellenic Republic, his asinine plan to hire tourists as “tax snitches” to report on cases of tax evasion, his high praise for Margaret Thatcher, and his statements calling for Greeks to lead an “austere existence” while he posed alongside his wife for a photoshoot at his luxury residence in Athens with a view of the Acropolis and a table set with a rich lunch spread. A scion of a family of wealthy Greek industrialists, Varoufakis is comfortable mingling with a crowd far removed from the “leftist” rhetoric he supposedly embodies. 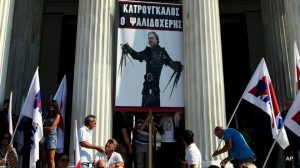 In January of 2015, just prior to that month’s elections, Varoufakis’ new book in Athens was presented by television talking head Babis Papadimitriou, infamous for proposing that the conservative New Democracy consider a future governing coalition with a “more serious” Golden Dawn, Greece’s far-right party. This is the same Varoufakis who is now poised to “save Europe from itself” through his new pan-European “pro-democracy” movement, DiEM25. The movement claims to have a plan to “reform” EU institutions, yet ignores the deeply undemocratic, authoritarian foundations upon which it has been constructed. And it further refuses to raise the specter of abolishing the grossly neoliberal European common currency project or to advocate for the bloc’s weaker economies to depart from the eurozone, including Greece. Zoe Konstantopoulou: Charting a new course or more of the same? Even more so than Yanis Varoufakis, the political figure who has been presented as a beacon of hope and change in Greece in recent months is Zoe Konstantopoulou, president of the Hellenic Parliament during the first Syriza-led government of January to August 2015. Like Varoufakis, she comes from a prominent family: Her father, Nikos Konstantopoulos, had been the head of Syriza’s predecessor party, Synaspismos, while her mother, Lina Alexiou, is the acting president of the (essentially defunct) National Committee for Radio and Television, a rough equivalent of the United States’ FCC. As president of the Hellenic Parliament, Konstantopoulou (via the same mass media which was purportedly battling her at every turn) engineered an image of a fierce champion of law and justice. This perception was formulated both as a result of the establishment of a parliamentary commission to audit Greece’s debt—overseen by Konstantopoulou—and by seemingly not being afraid to speak out against the male-dominated Greek political establishment. The devil is in the details, however, and many of the details of Konstantopoulou’s tenure were overlooked. The debt audit commission began its investigation in parallel with statements repeatedly being made by Yanis Varoufakis, Prime Minister Tsipras, other Syriza government ministers, and even the newly-elected president of the Hellenic Republic, Prokopis Pavlopoulos, promising that Greece’s debt would be repaid in full. The otherwise outspoken Konstantopoulou did not respond to these statements, nor did she address actions such as the implementation of a decree to confiscate the cash reserves of the Greek public sector for the purpose of repaying an IMF loan installment. In fact, Konstantopoulou voted for Pavlopoulos in the parliamentary vote to confirm him as the Hellenic Republic’s president, just as she voted to confirm all of the austerity bills passed by the Syriza-led government during its initial term in power. Far from speaking out, Konstantopoulou publicly stated in May 2015 that Syriza’s pre-election promises to “tear apart the austerity agreements” were a mere “figure of speech.” These are hardly the actions of a dynamic anti-austerity advocate of justice, and neither was her show of support in favor of the Tsipras government following the betrayal of the July 5, 2015 referendum result which rejected the lenders’ austerity proposals. Instead of speaking out against the government or resigning from her post–even at that late moment, even following the passage of the third and harshest memorandum agreement to date, Konstantopoulou continued to publicly support Tsipras and the Syriza-led government, just as she, as president of parliament, never suspended parliamentary debate as further austerity bills were being debated. Konstantopoulou courageously voted “present” (as opposed to “no”) in the parliamentary vote ratifying the third memorandum agreement. The public proclamations of support for the Tsipras government only ceased when Konstantopoulou and other Syriza “renegades” were informed that they would not be included on the ballot for the September 2015 snap parliamentary elections. Panagiotis Lafazanis is no stranger to the political landscape. 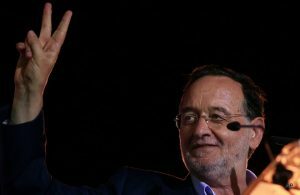 An old mainstay of the Greek “left,” Lafazanis has passed through Greece’s Communist Party (KKE), Syriza’s predecessor party Synaspismos, and Syriza prior to founding the Popular Unity political party ahead of the September 2015 elections. While Lafazanis did suspend two licenses issued to the operators of the Skouries mine, the Canadian-owned Barrick Gold Corp., gold mining activity in the region continued, as did the government’s talks with Suez and other foreign corporations which are interested in buying up Greek water utilities. Lafazanis delivered mixed messages, stating his opposition to the mining activities while referencing Greece’s “commitments” to its investors. Like Yanis Varoufakis and Zoe Konstantopoulou, Lafazanis voted in favor of the election of Prokopis Pavlopoulos as president of the Hellenic Republic; he also voted yes for all of the austerity bills presented by the Syriza-led government leading up to the July 5, 2015 referendum. Like Konstantopoulou, Lafazanis also continued to support the Syriza-led government even after the betrayal of the July 5, 2015 referendum outcome. 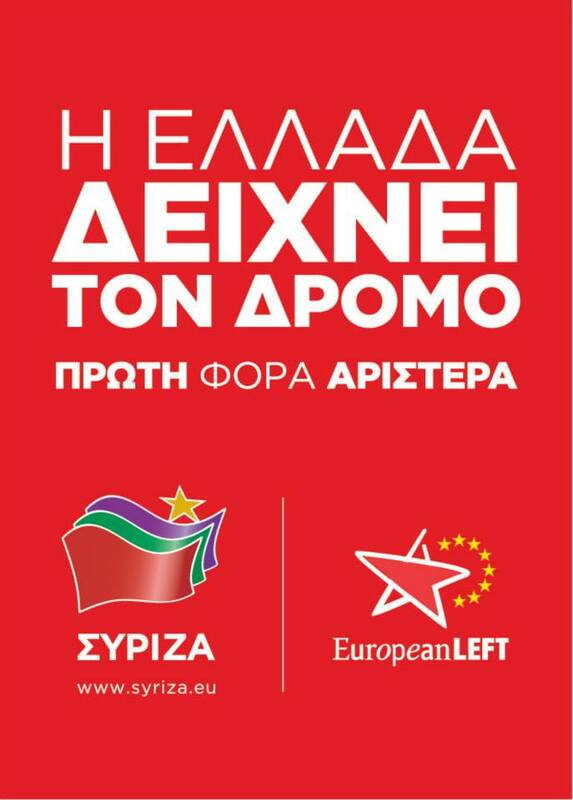 This support continued until Lafazanis, like Konstantopoulou, was not included on the Syriza ballot for the September 2015 snap elections. It was at this time that Lafazanis hastily announced the formation of Popular Unity, a purportedly anti-austerity party which essentially regurgitated the old Syriza promises from prior to its initial elections, while presenting mixed messages regarding its stance on a “Grexit” and whether Greece should remain in the eurozone or return to a domestic currency. Far from representing truly alternative voices, Yanis Varoufakis, Zoe Konstantopoulou, and Panagiotis Lafazanis have acted as political opportunists. They’ve crafted a public image as anti-austerity renegades and champions of democracy and justice, even as their real actions while in a position of power and authority belied that empty rhetoric. This matches Syriza’s ascension to power and its current ludicrous efforts to pass off the harsh austerity and privatization regime that they are enforcing as an example of “leftist” politics and a triumph of “social justice.” It is absurd to believe that political figures who voted for and justified the policies that they are supposedly denouncing are capable of delivering on those same promises. Instead of placing all their hopes with the next establishment-anointed political savior or an official electoral process, Greek voters have a golden opportunity to make their voices heard and demand real change. Each day is a chance to call for an end to stifling austerity and privatizations that are further crippling the domestic economy, the much-needed reform of Greece’s corrupt justice system and collapsing educational and health care systems, and a departure from the European Union and the eurozone, two institutions which have been so destructive for Greece, its people, and its economy. Even as more and more rumors circulating in Greece of impending snap parliamentary elections, the time has come for the people of Greece to become their own saviors rather than place their homes with tired, discredited political retreads. Michael Nevradakis is a Ph D candidate in media studies at the University of Texas at Austin and a US Fulbright Scholar presently based in Athens, Greece.